At the German Open Golf Championship for Disabled Players in different categories (held yesterday, July 12th in Munich), Shlomo Ivgy, member of ZDVO golf team came in First Place in the category of wheelchair bound players who play using a “Paragolfer” (a mechanized chair which enabled them to play standing up like a regular, standing player). Israeli Consul to south Germany, Dan Shachar, attended the event. 75 players took part in the championship, 20 of them arm amputees, 30 with leg disabilities, 8 wheelchair bound, blind and other varying disabilities. Participants came from Finland, Italy, France, Czech Republic, UK, Austria, Switzerland and the seven members of the ZDVO Golf Team: Moti Bignitz, Yoram Kichel, Makbel Shofania, Eli Shrira, Bario Chayoun, Shlomo Ivgy, Moti Cohen and the team coach Tamar Partosh. The Haifa Beit Halochem Golf Team plays under the auspices of the Caesarea Golf Club where it regularly holds its practices alongside regular golfers. 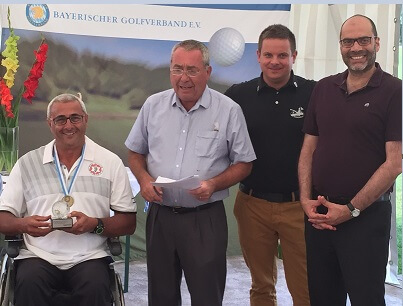 There’s no doubt that the recently held “Israeli Golfers with Zahal Disabled Veterans” Golf Tournament which took place at the Caesarea Golf Club 10 days ago contributed greatly to the high level of playing displayed at the German Championship.